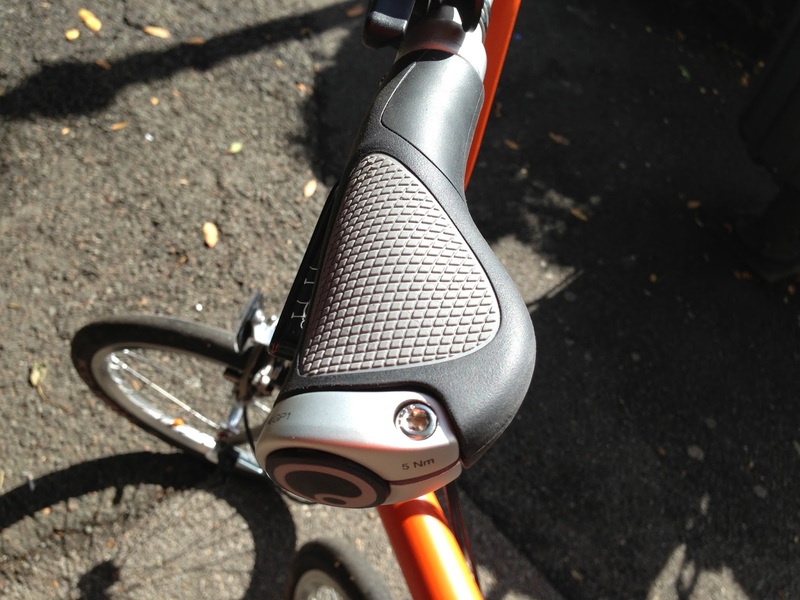 I used to have a pair of GS1 grips on my Titanium Orange Brompton when it was an M Type. In order to get them to fit I had to take a knife to them and cut about a cm off. Even though I think I did a pretty good job, being fussy I decided to get another pair of Ergon grips when I converted it to an S type. I opted for a pair of GS1 grips. The GP1's are I suppose the classic Ergon shape. I decided to get these as I wanted ultra comfort. The more rounded edges of the GP1 appealed to me. I have placed the old GS1grips on my Original Orange Brompton and are happier with the feel of them on the M type handlebar. Having been on quite a few rides recently, some of them a fair distance, I have to say they are lovely on the hands. There are lots of different grip positions and I cannot fathom why it has taken nearly three years to walk away from the original Brompton foam grips? Fitting is really easy and once in the correct position for your hand they are great. If you are suffering with the original Brompton grips you could do worse than have a look at these. They really will make life easier. Having large hands I opted for the 'L' large version but there is also an 'S' version for those with smaller hands. Hi Orange. Hope you're well. Would these grips fit my M-Type, with its 2012 brake levers? Hello. They would but you'd have to cut them to size. Not too bad a job but well worth it. For the S bar they go on as they are. 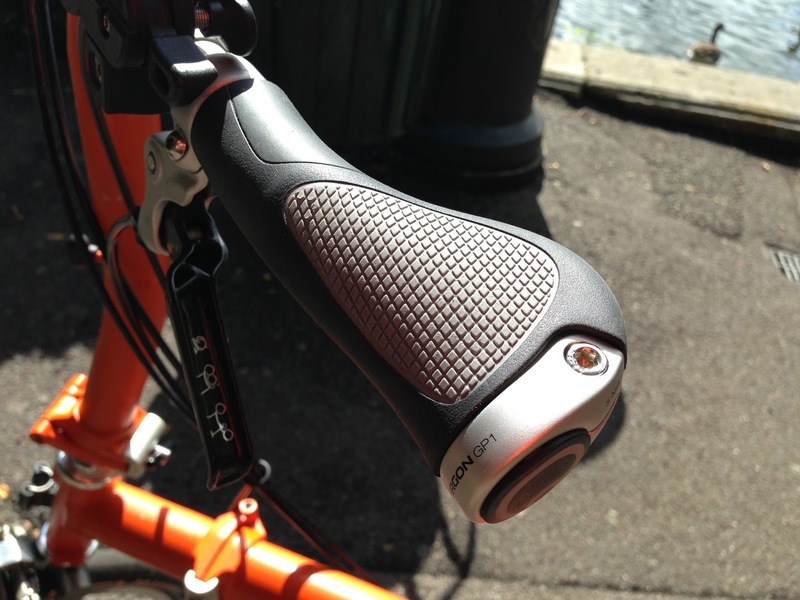 Or maybe he could use the "gripshift" version of the grips, which are shorter. Orange, did you use any sort of glue to fit these? I tightened mine as much as I could, but the still move around a bit. hi, which model of the GP1 did you get? i have a 2013 S bar? Hello. I got the large version if that is what you mean. These are brill. Don't know what took me so long. I have the small version, so comfy. I just fitted GP3-L grips to my S3L, I didn't have to relocate anything on the bars & the allen bolts tightened everything up perfectly. They don't interfere with the fold and they don't touch the floor when folder either. Took 10 mins, sorted. I have the s type brompton... What'sa better choice... Gs1 or gp1??? Thanks!! Either will work fine. Comes down to personal choice.